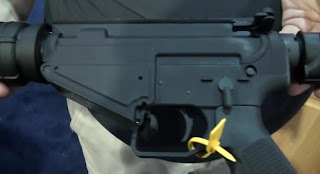 Rock River Arms is trying out a new DI gun chambered in 7.62x39 and to avoid all the problems with trying to make a reliable magazine to feed the 7.2x39 ammo via the standard AR magwell they came up with the idea to use standard AK-47 mags. Doesn't look like there is a facility for a bolt hold open lever. 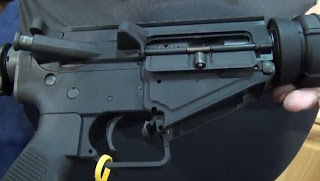 From a California perspective it doesn't look like it would be easy to create a "bullet button" device due to the mag release lever is inside the trigger guard and it being so wide. Looks like it could be done but it would be a little more awkward than usual. The other route would be to put a non-collapsible stock, muzzle compensator and switch out the pistol grip for a California-ize grip. Then it would be good to go. This way would be best especially if you have pre-ban normal capacity magazines. Then you could use them without an issue. The MSRP of the LAR-47 is reported to be in the upper $1,400.00 range. The price to pay for innovation. The upper is specifically fit to the lower in that it is designed to clear the AK magazines. So you can't just buy an 7.62x39 upper and stick it on the RAA LAR-47 lower. Come with chrome bore and bolt and in carbine and mid-length. Initially the lower will be billet eventually transitioning to a forged lower. Nice and wide mag release paddle allows easy access from both sides of the receiver. They were mentioning that during their testing it would shoot almost any ammo which means, to me anyway, that it is probably a little over gassed due to the variation of loads from different ammo makers and even differences in ammo lots. That's what I have noticed anyway. Shouldn't be a big deal except the rifle might foul up a bit quicker just because the ammo is inherently dirtier. All speculation on my side. Didn't crack it open to see if there were any unique to the rifle modifications. I would have like to see the bolt. Oh well. Can't wait to read reports of the gun out in the wild.